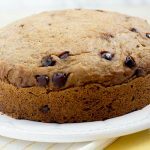 The best part about this Instant Pot banana bread is that, by adding more sugar or chocolate (or both! ), you can turn this semisweet bread into a dessert. Place butter and sugar in large mixing bowl. Using a hand mixer, mix butter and sugar until fully combined. Add eggs and vanilla extract and mix again. Add peanut butter, mix again. Then add bananas and mash with a potato masher until fully combined. Using a separate large mixing bowl, combine all dry ingredients with a whisk. Pour wet ingredients into bowl with dry ingredients. Using a rubber spatula, fold ingredients together until fully incorporated. But do not overwork. Add chocolate chips and fold them until evenly distributed. Spray 7-inch pan with nonstick cooking spray. Pour batter into pan and spread out evenly. Cover pan with aluminum foil. Add 3-inch trivet to pot with 1 1/2 cups of water. Place covered pan on top of trivet. Lock lid and cook for 75 minutes at high pressure. Once cook time is complete, allow pressure to release naturally for 10 minutes. Then quick-release remaining pressure. Remove lid, take out pan, remove foil, and let cool for at least 10 minutes before slicing. The best part about this recipe is that, by doubling the sugar or chocolate (or both! ), you can turn this semisweet bread into a dessert with ease. For this recipe, I intentionally wanted to create a drier bread (to balance the added peanut butter and chocolate chips). But if you prefer a bread with a more moist consistency, simply add a third banana!